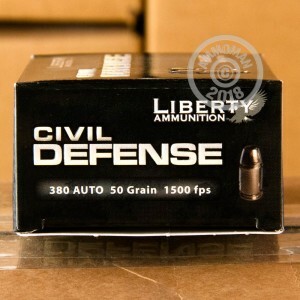 If you're looking for an accurate, high-velocity, precise self-defense ammunition, look no further than Liberty's Civil Defense line. 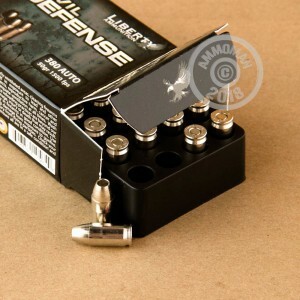 Each of the 20 hollow point bullets has a muzzle velocity of 1,500 feet per second. Each solid copper, fragmenting hollow point projectile is designed for optimal expansion and penetration in soft tissue, and has reduced recoil for more accurate shooting. Liberty Ammunition, based out of Sarasota, FL, was started by engineer and entrepreneur, PJ Marx. Marx decided to utilize his engineering skills to create small arms ammo for self defense. Each round is boxer-primed, non-corrosive, and reloadable.